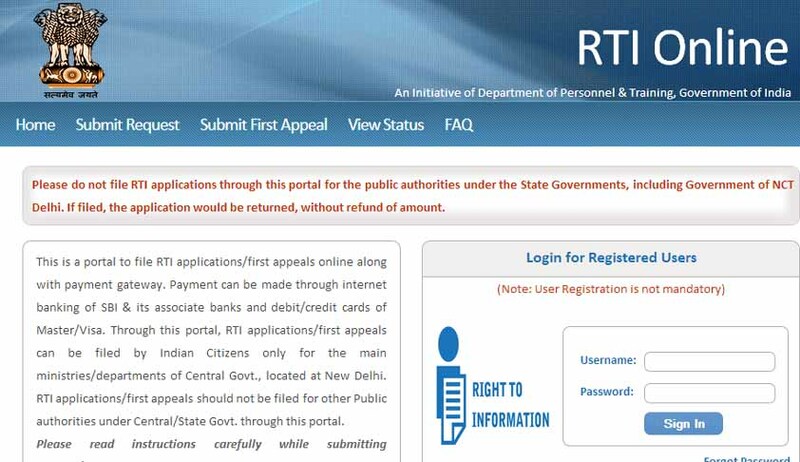 The government has launched an exclusive portal –www.rtionline.gov.in– to enable citizens to file RTI applications online. This would be applicable for all the ministries under the Central Government. The Ministry of Personnel, the designated administrative department for implementation of the transparency law, will be writing to all state governments asking them to adopt the online platform filing of RTI applications. “At present, about 82 central government ministries have been covered with this portal. Soon we will bring all Public Sector Undertakings (PSUs) under it,” the Minister of State for Personnel, Public Grievances and Pensions has said. The Right to Information Act, enacted in 2005, mandates timely response within a period 30 days to citizen requests for government information, upon the payment of nominal fee of Rs 10. The information seeker can submit this fee via Internet banking through SBI and associated banks by using the website. Payment can also be made by credit or debit cards. Currently, the text of an application that can be uploaded at the prescribed column on the website is restricted to 3,000 characters only. In the event an application contains more than 3,000 characters, it can be uploaded as an attachment.